Great Danes are great dogs famous for their giant size. They are also very friendly and loyal dogs who make excellent pets. The question is though, how much do Great Danes cost? The price of a pure-breed Great Dane puppy stays in the range of $500 to $1600. 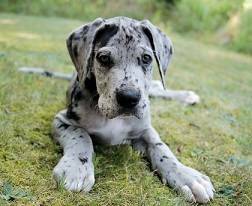 The cost of a Great Dane puppy varies depending on the demand for these dogs in your area as well as the age of the puppy. The ideal time for a puppy to be taken to his/her new home is between 2 to 6 months of age. Puppies younger than that still need to be taken care of by their mom, and puppies older than 6 months won’t adapt to the environment of the new home as easily as younger pups. Therefore most people looking to buy a Great Dane or another puppy want one that is anywhere from 2 to 6 months old. However, when there’s a lot of puppies in the litter, a breeder might not be able to find a buyer for all of the puppies before they turn 6 months old, and then they will have to lower the price in order to find a new home for the puppy before they get even older. If you are looking to buy a Great Dane puppy, don’t forget to check the rescue shelters located in your area as well. For one, if you’d adopt a dog instead of buying one from a breeder, it will cost you a lot less. The adoption fee is around $150 to $300. For two, you would give a home to a doggy who really needs it.